One of the problems with measuring Incident Response is that many of the commonly used metrics are not actually related to the performance or efficiently of the IT/Security staff. Issues like the number of “Ransomware attacks contained”, “web brute-force attacks controlled” or “phishing emails blocked” are not directly measurable against the IR staff; thus it is hard to gauge the impact new staff, training or tooling has on the team’s abilities. In this series of blog posts I aim to look at some of the metrics that can be tracked, by staff so they can identify areas for improvement and how new improvements are improving their performance. I will also identify the influencers of these areas so you can understand what to focus upon. These are based upon the evening presentation I gave at SANS Munich in March 2018, the slides from this are available here. To be able to examine and understand the improvements we can bring to the overall IR process we need to breakdown the stages of handling our incidents into smaller discrete tasks. While still aligned to the NIST Computer Security Incident Handling Guide (800-61R2) [https://nvlpubs.nist.gov/nistpubs/specialpublications/nist.sp.800-61r2.pdf] by breaking down each task in the IR process, we can examine the aspects of the business that influence the time taken for each. Thus we can look to improve the overall IR response time by removing the individual task bottlenecks and roadblocks. 6 – Command and Control (potentially). 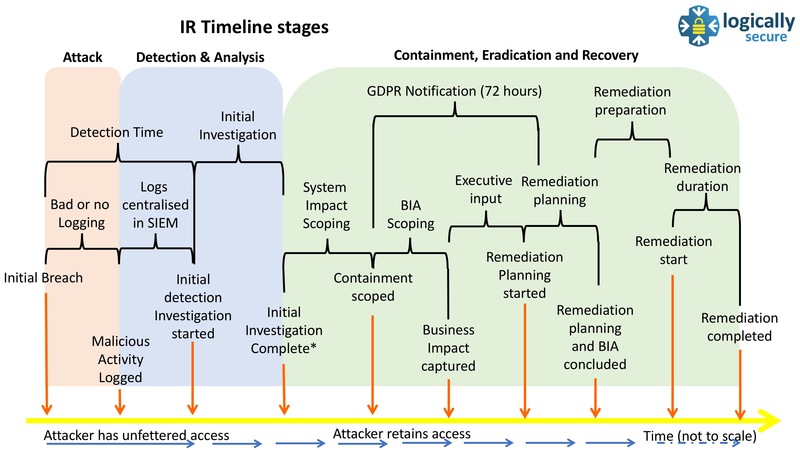 Below is the colourised version of the diagram I presented at the SANS@Night Munich event, and I will refer to this as we step through the IR process. This post will look at the Attack and Detection time. Note: In this blog series, I am working on the assumption that with GDPR being enforced from 25th May 2018, we will use the phrase “Case” before declaring an “Incident”. Furthermore, we will commence GDPR Notification once PII or user data has been identified as being affected. The Detection Time is the time taken for the attackers activity to be actually detected. Simple though that may seem, it is surprising how long that can take in some organisations. The Mandiant M-Trends reports have tracked the Average time from Compromise to Detection and while this has improved in recent years, it still shows the attackers having sufficient undetected time on the network to build out a covert infrastructure. 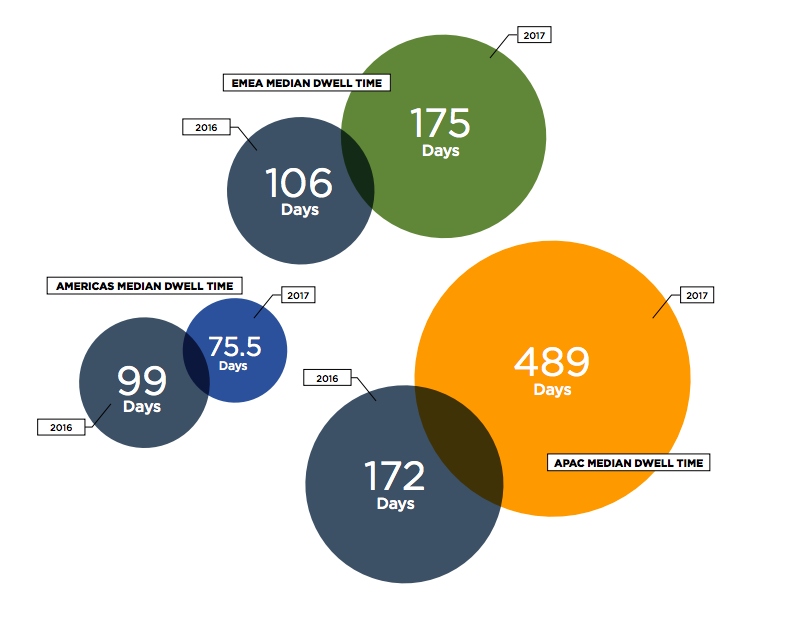 Dwell time is the number of days from first evidence of compromise that an attacker is present on a victim network before detection. A median represents a value at the midpoint of a sorted data set. Mandiant continues to use the median value over ‘mean’ or ‘average’ to minimize the impact of outlying values. In analysing this Detection Time, we break it down in to two distinct parts; the initial part when little or no logging of value occurs and the part when some activity is logged and centralised or alerted upon . Windows hosts that don’t have Windows Event Forwarding (WEF) enabled to push at the least Event IDs from the desktop hosts: 4624 (logon), 4625 (failed logon), 7040 (service changed from disabled to auto-start), 7045 (service installed), 4648 (logon explicit creds). Web proxies and WEF that are not in transparent mode so the proxy IP is recorded in all web server logs; rendering them almost useless. Servers with non centralised log files still with the default size of (20Mb). Applying a validated good logging profile to all systems, especially internet connected (desktops) and facing systems (servers). Implementing a host-based IDS/IPS with central logging/alerting enabled. Centralising these logs for analysis. Once the logs are centralised they can then be analysed and some form of correlation can be conducted. The common problem here is that either too much or too little is being logged. Too little and the chance of seeing the attacker is reduced. Too much data being logged and your ability to process, correlate and store the logs will be hampered. Additionally, while IR staff as for *. * “all the logs” what they usually want is the right quality logs with suitable data fields included. This is a key distinction as many SIEMs charge on events per second and therefore there is a simple cost ceiling as to how many events you can add to a SIEM. Thus you may want to store and stage your logs before pushing a filtered stream into your SIEM. A very good paper on this was written by ContextIS (commissioned by the UK NCSC) and is here. So now we have our logs in the server or SIEM, we need to have an idea of what to look for. While most SIEMs come with some rule engines, not all come with these rules configured. Thus new installations with new staff lack an appreciation of what to look for and how. Furthermore, they lack good sourced of Indicators of Compromise (IoC) or Cyber Threat Intelligence (CTI). Without these the team will be slow to detect attacks as low levels of automation mean that detection does not happen based upon IOCs but from analyst assessing logs. This is exceptionally expensive and it introduces varying quality as different teams work at different rates “night shift syndrome” (where the *other* shift never seems to find as much stuff as the your/day team). So by introducing some good sources of IoC’s and CTI analysts can create watch-lists, and cross check the results rather than manually searching logs. Get filtered logs to SIEMs to maximise CPU and license investments. Identify good Cyber Threat Intelligence and Indicators of Compromise feeds – note many of the good ones do cost. Automate the detection of commodity malware and attacks.